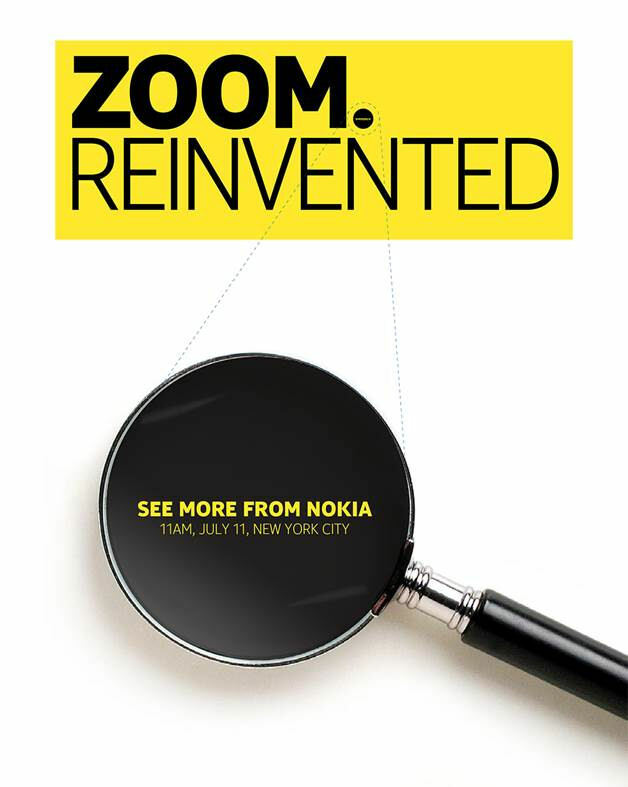 Nokia is set to hold a press event in New York on July 11th with a tag line of "zoom reinvented", suggesting that it may be about to unveil a new camera flagship to follow in the footsteps of the Nokia 808 PureView. A teaser image shows a magnifying glass with a message of "see more from Nokia", together with date, time, and location of the event. The Nokia 808 PureView used its 41 megapixel sensor to enable a lossless 3x zoom (5 megapixel image capture), something that would seem to qualify as zoom reinvented. Nokia has repeatedly said that this first implementation of PureView would be used in future products and it seems the Finnish company is now going to deliver on that promise by introducing a Windows Phone 8 version of the world's most advanced camera phone. The device being announced is most likely the much rumoured Nokia EOS. Given that the Nokia 808 PureView was announced more than 16 months ago it seems likely that Nokia will have further refined its imaging technology in both the hardware and software departments, but we'll have to wait until next month to find the full details. It's worth remembering that zoom was only part of the Nokia 808 PureView story. There was also a capability to capture images at resolutions up to 38 megapixels, but arguably the most significant was the pixel oversampling technique used by the camera that produced 5 megapixel images from the 41 megapixel sensor by combining up to seven pixels into one super-pixel. This oversampling technique resulted in images with very low levels of digital noise, and unparalleled detail and colour accuracy, and has become the benchmark by which all camera phones are judged.